Paul Joseph Mwau Mwangi Kaposvár University, Faculty of Agricultural and Environmental Sciences, H-7400 Kaposvár, Guba S. u. 40. György Bázár Kaposvár University, Faculty of Agricultural and Environmental Sciences, H-7400 Kaposvár, Guba S. u. 40. 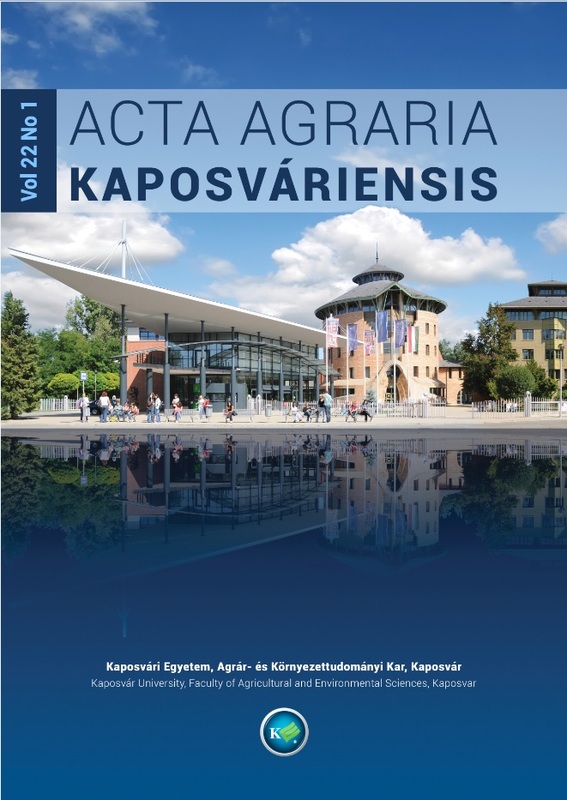 Tamás Tóth Kaposvár University, Faculty of Agricultural and Environmental Sciences, H-7400 Kaposvár, Guba S. u. 40. The polyunsaturated fatty acids (PUFA) of the n-3 and n-6 group are important in the human body. It is therefore important that these fatty acids are consumed in the right amount and correct proportion so as to maintain a healthy physiological status in the body. Certain foods are naturally rich in these fatty acids, such as sea foods and some oilseeds. Fish and fish oils are rich in eicosapentanoic acid (EPA) and docosahexanoic acid (DHA) which are n-3 fatty acids, they play a crucial role in improving the physiological and health outcomes in conditions such as cardiovascular diseases, cancer, immune suppression and mental health. These fatty acids have also been shown to play beneficial role during pregnancy and lactation. Linolenic acid (LNA) which is abundant in oilseeds such linseed is a precursor of EPA and DHA in the human and therefore can be converted when need be, however the conversion is not very efficient and therefore cannot be used as a substitute. With the current deteriorating state of the global supply of fish and the high demand of energy causing diversion of resources to produce biofuels, the availability of these natural sources of n-3 and n-6 foods is growing ever scarce. Feeding of full-fat linseed and/or linseed oil has been shown to substantially increase the content of LNA in animal products such as meat, eggs and milk. On the other hand, fish oil supplementation in animal feeds also leads to a substantial increase in EPA and DHA to levels that can positive health effects to the public. Due to this potential to increase the amount of n-3 polyunsaturated fatty acids in animal products, it is seen as a simpler and cheaper way to deliver an increase in consumption to the wider public in a sustainable manner. This is due to the fact that products such as milk and eggs are more widely distributed and available in the market. Some challenges are of course present, such as negative effects due to the oxidative stability of polyunsaturated fatty acids which can have negative effects on rumen function and product organoleptic characteristics. To offset the problem of rumen biohydrogenation of PUFA, various methods of protecting the seed and fish oils have been devised, allowing for feeding even higher doses without impacting negatively on production and product quality.